Vegan Clutch/Pouch: Polyurethane (PU) leather with fabric lining and gold-tone hardware. 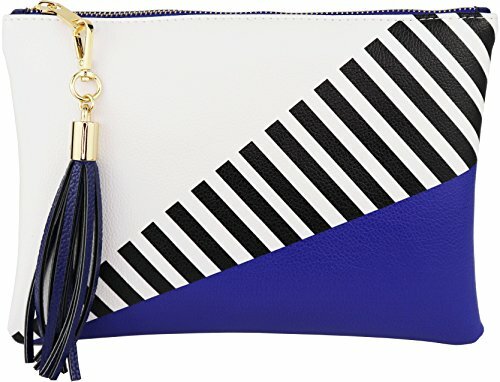 Zipper closure with attached tassel accent at the top of the clutch with three interior pockets: two small, open pockets and one interior zipper pocket. Easily fits a small wallet, cellphone, small notebook, pens/pencils, makeup or whatever items you use on a routinely basis. Or whatever you use it as: a clutch bag, a cosmetic pouch or toiletry case. 10.25"(L) x 7.5"(H) x 0.5"(W) with adjustable PU leather and tassel accent. If you have any questions about this product by B BRENTANO, contact us by completing and submitting the form below. If you are looking for a specif part number, please include it with your message.